Leo is just about to turn 7 years old, and it seems rather crazy to think that my little blog baby has grown up so much, and it's just as crazy to think that my blog is the same age! Over the last 7 years I have shared so much of myself and my blue eyed boy here, and I love that all of those memories are safely tucked away. Just over a week ago we took a family visit to the Warner Bros. Studio Tour to experience their latest feature: The Goblet Of Fire. The Goblet Of Fire experience commenced on the 30th March 2018 and runs through to September 23rd 2018. If like myself, you have visited more times than you can count on your fingers.... You will still go along and see so much for the first time. This was Leo's second visit, and on the run up to our visit we worked our way through the first 4 films all over again. I wanted Leo to come along and have everything in the very forefront of his mind. I wanted him to be able to recognise what he saw on screen in the studios, because after all that is what it is all about. It's been 2 years since Leo's first visit, it was nice to see that he had retained many of the memories he made even after all this time. The tour starts as it has always done, only this time while you are lining up in reception you can feast your eyes upon the very large Goblet of Fire that has taken up residence there. Ok... So before I go into our most recent visit, all I am going to say is... I hope you like photos. I have so much I want to share with you, so sit back and prepare yourselves for photo spam! You are then taken into a side room where you are shown a history of the Harry Potter series and how Potter mania was born, once this wraps you are taken into a cinema screening, and this is where the real fun begins. I never like to give to much away on this front because I will never forget that initial WOW factor I felt when I first visited... I would hate to take that away from any of you! Just trust me, you will not be dissapointed! Once the cinema screening wraps your first point of official set touring is within the.... *Drum Roll*.... Great Hall! This set is not to be underestimated, it is incredible. The floors are solid slabs and the attention to detail is second to none. You look up expecting to see a bewitched ceiling (which of course isn't there), but the rest of the room is exactly as you see it in the films. As everything is set up for The Goblet of Fire, you will find the special effects version here, and you will even get your own demonstration, so that you can witness how the cup drew the names. You will even get your own parchment to take away with Harry Potter's name on it! Fact: There were 2 versions created of the Goblet of Fire. The original goblet was handcrafted by head prop maker Pierre Bohanna. This was crafted from one single piece of wood. A mould was then taken from the original and the special effects version was made (You can see the original goblet on the tour). I loved that they had even set up the age line around the goblet and had the Weasley twins trying to put their own names into the cup. You could quite easily spend all your time in this one set, but your time in this room goes very quickly, as the next set of people on the tour have to come in. We moved on into the next part of the tour at this point and I was impressed to see just how different it all was to the last time I went along. Some of the props and arrangements that have always had a place were still there, but it was nice to see that they had been refreshed or had some additional details added. You will recognise this from the Yule Ball in Harry Potter and the Goblet of Fire. I have always been impressed by this particular piece. Remember when Harry Potter receives the egg from the dragon in the first challenge of the Triwizard Tournament? You will recall that Cedric Diggory gives Harry the heads up about taking the egg with him for a relaxing bath. These are the Prefect's bathroom taps complete with the multi-coloured water from the 53 spouts! The original Goblet Of Fire: It was carved out of one single piece of wood that was specifically chosen for its twists and knots! In all my visits I had never come across the Philosopher's stone before, I loved this cabinet that was full of little trinkets from the films. You will even spy a Rememberall to the very back left of the below photograph! The egg Harry retrieved from the dragon in the first Triwizard challenge. Leo inspects the Gryffindor common room at Hogwarts School of Witchcraft and Wizardry. The magical car that almost had Harry and Ron exposed to the muggle nation in Harry Potter and the Chamber of Secrets is set up against the green screen to show it's encounter with the womping willow! Another favourite from Harry Potter and the Chamber of Secrets: Many people thought that the door to the chamber of secrets was in fact a computerised effect... But as you can see, that is not the case. It is a real work of art. Now here is a pretty cool aspect for those of you who are really into your dark arts or have a secret (or not so secret) soft spot for the Dark Lord. Tom Riddle's grave is on display at the studio tour and it really does have to be seen to be appreciated. Leo really threw himself into our most recent visit to the studio, and for me that just makes me so happy. Leo can often hold himself back from experiences because he feels unsure about them, you could say that he over thinks the scenarios that he faces. This really does make me feel sad at times because I know that deep down he really does want to take part. He had talked about going on a broomstick against the green screen, but he didn't want to dress up. In fact it wasn't just that he didn't want to, he was going to point blank refuse. When the time came though, he slipped on his Slytherin robes (his choice of house no less), and he rode that broomstick like he was a pure blood wizard. And doesn't that smile speak volumes? 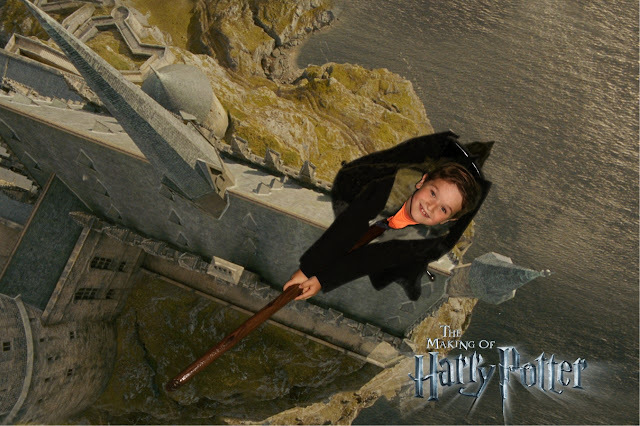 I know it sounds crazy to be proud of your muggle son for riding a green screen broom, but on that day he overcame obstacles and stopped caring what everyone thought for a moment. At that precise moment in time he was as carefree as any other boy his age. With our green screen photos under our arms we moved toward the Forbidden Forest. Luke and I had both come along just before it opened to the public last year, but for Leo this was the highlight of his visit, and we hadn't even got all the way through the gates before he was telling me just how cool it was! Another highlight from the Forbidden Forest was the spiders... You MUST go along and see Aragog.... and prepare yourselves for a jump or two. I am absolutely gutted that I didn't capture Leo's reaction on film! Leaving the spiders far... far behind us we made our way through to Platform 9¾. On our last visit this had been the absolute honey pot for Leo, but I think this time it came a close second to the Forbidden Forest. We tried are darndest but unfortunately we are all muggles through and through. So instead we focused our efforts on simple muggle opportunities (maybe that is why there are so many photographs in today's blog post!). We tried Butterbeer, and Leo decided that it is nice but the best bit is the frothy top. And finally we made our descent from the castle, preparing ourselves to walk back into the muggle world. I may or may not have got very excited to spot the Beauxbatons carriage complete with their winged horses flying in to Hogwarts ready for the Triwizard games! I particularly loved this shot because you can barely see the wires holding it in place. It was yet another incredible visit, we all had the most amazing time (even Luke who hates to admit it! ), and we WILL be returning again. Disclaimer: We were invited along to the Goblet of Fire feature and provided with entry and a few other little goodies. All views and opinions expressed within this post are completely honest and my own.